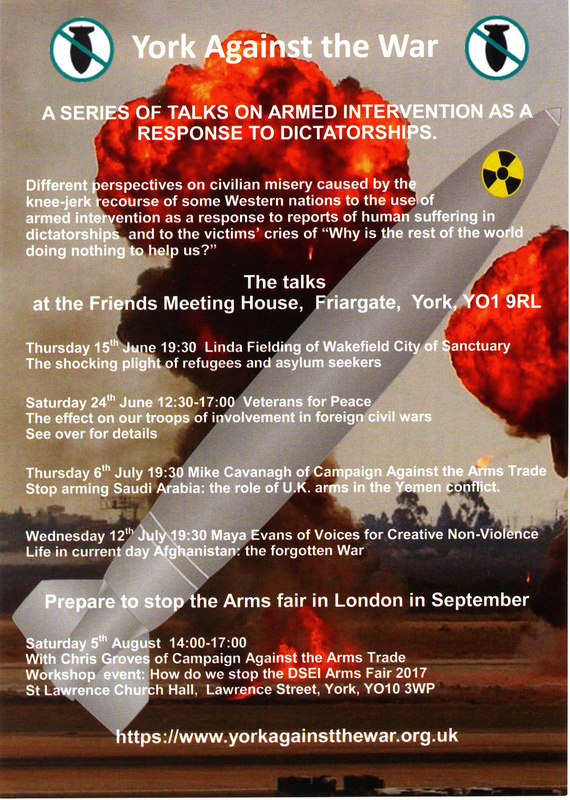 Stop the Arms Fair in York-this Saturday! Stop the Arms Fair is in York this Saturday! We’ll be running a workshop with York Stop the War at the St Lawrence Church Hall in York on Saturday 5th August from 2pm to 5pm. It’s free to attend and there’s no need to book- just join us on the day. Expect creative action ideas, and some friendly faces to take action with- activists from York and the surrounding area are already planning to join the week of action this September, and there’s plenty to do over the summer to help build the movement to shut down DSEI. The DSEI arms fair is one of the world’s largest arms fairs, and comes to London every two years. It’s scheduled to return in September 2017- unless we can stop it! A huge week of action is planned to stop the set-up of London’s DSEI arms fair between 4-11 September 2017, and it will take all of us to stop the arms fair. 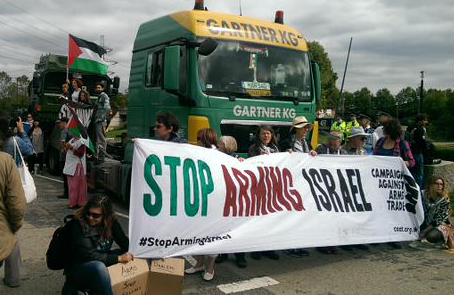 You can read more about DSEI on the Stop the Arms Fair website. You can see more details of the workshop online, or join the facebook event. Please invite your friends and help us spread the word! Posted in General	| Comments Off on Stop the Arms Fair in York-this Saturday! Notwithstanding the populist and securitised backlash of recent years, mass migration from Africa and the Middle East to Europe is near certain to continue for the foreseeable future. This is due not so much to the continuation of violent conflict, which is difficult to predict, as to the near certainties of economic marginalisation and climate change. Effective, just responses are possible, but only if we recognise that migration and climate change are now inextricably related and that that this is an issue for the “now”, not the future. Last October’s briefing examined European attitudes to migration, especially in relation to the substantial numbers of often desperate war refugees trying to get to Europe from Syria, Iraq, Afghanistan, Somalia and elsewhere. It pointed to the deep antagonism that had developed in the destination countries, not just to refugees from violence but to migration as a whole, with this prompting the enhancement of far-right political ideas and associated parties, not least in Eastern Europe. On an apparently unrelated topic, an earlier briefing last year took a wider look at the issue of climate change, pointing to the evidence of an increase in the rate of warming and asking whether that would be sufficient to prompt intergovernmental action. It concluded that much depended on the results of the US presidential election. 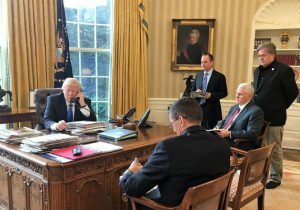 In the event, Donald Trump’s success did not show much promise but last November’s briefing pointed to the increase in commitments by a number of governments as well as impressive technological improvements in the exploitation of renewable energy resources. That somewhat optimistic conclusion in no way diminishes the problems faced, and this briefing examines one of the most fundamental of these – the impact of climate change on migration in the context of the social attitudes cited above. One of the most substantial migratory movements in the century to 1940 was from Europe to the United States and a second was to Australia after 1945, with both countries now experiencing political moods that are particularly antagonistic to further inward migration. For Western Europe the much more recent experience after 1945 has been of immigrants from former colonies or the Middle East, which also led to periods of considerable antagonism and social unrest. In the past decade there has been a further substantial increase in migration, primarily into Europe. The origins draw broadly from two areas – firstly, the refugee flows from war zones already mentioned and, secondly, what are often described as economic migrants, not least from sub-Saharan Africa. These latter movements have been made more possible because of the chaos in the failed state of Libya following the western-supported regime termination in 2011. The continuing of refugee flows from war zones will depend substantially on the levels of violence that are experienced across the Middle East and North Africa. This cannot be predicted with much certainty, but the movements from sub-Saharan Africa are more clearly predictable and are likely to increase substantially due to the combination of one existing element and one that is only just becoming apparent. The first is the awareness among some millions of relatively marginalised peoples that their life chances may both be dismal and unlikely to improve. 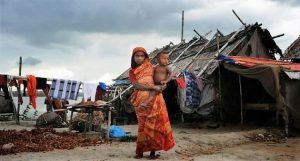 For many hundreds of thousands of people one such response is to seek to migrate to wealthier regions where work may be available. Typically in such circumstances, extended families or even wider communities may share resources to enable a fit young man to attempt the journey, hoping to succeed, find work and then send money back home and perhaps even enable relatives to join him. The journey may be fraught with danger but the rewards are sufficient when measured against the levels of desperation. Such migratory pressures may be difficult to explain generically, given that many countries across sub-Saharan Africa are experiencing modest degrees of economic growth, but there is abundant evidence that this economic success is not shared equitably. At the same time, improving literacy and communications make marginalised communities all too aware of their predicaments. Given that there appears to be little prospect of moving towards more equitable economies, the expectation must be that migratory pressures will be maintained. This points to the progressive securitisation of migration, which is already problematic but likely to become more so with the onset of the impact of the second factor, climate change. In relation to climate change, two elements concerning migration are particularly relevant. One is that in many parts of the world the process is accelerating and the second is that its effects are geographically asymmetric. The rate of change in the near Arctic is currently exceeding the prediction of the most reliable computer simulations but there is also growing evidence that this is also happening in many regions across the tropics and sub-tropics. In these regions the main effects are increases in temperature and decreases in rainfall, the latter because of a trend for rainfall to be distributed away from land masses and towards the oceans and the polar region. The primary impact of this is on the ecological carrying capacity of tropical and sub-tropical agricultural systems, with the capacity to produce food much diminished. That means that nearly one-quarter of the world’s population could be living on less than 500m³ of total available fresh water per year. That is Currently, World Bank data lists at least 27 countries surviving under such conditions. While a few of them, like Israel, Singapore, Malta and the Gulf States, have the wealth to invest in desalination, storage, imports or draining aquifers of millennia of deposited water, this will not be the experience of most. Indeed, even most such high-tech schemes may only last for decades, as long as the aquifers or oil wealth available. Notably, the list of countries already experiencing absolute water scarcity includes all of the Arabian peninsula, North Africa (except Morocco) and the Levant (except Lebanon) and large parts of Central and Southwest Asia and the Horn of Africa. Some of the most critically affected countries included Yemen, Sudan, Somalia and Syria. It may be no coincidence that these countries are some of the world’s most conflict-affected, nor that they have produced some of the largest volumes of refugees in recent years. Looking from Europe, where not one mainland country is yet threatened by such water scarcity at a national level, populations are largely static and the effects of climate change relatively subdued, violent competition for such a basic resource may seem remote. Yet it is striking how closely the map of water-stress aligns with the maps of global conflict and displacement in the first decades of this century. As populations in the stressed Southern regions are growing and fresh water supplies there constant or, far more likely, decreasing, the Mediterranean is likely to look like a very narrow moat indeed between the water-rich and water-poor worlds. • A much more rapid transition to ultra-low carbon economies across the industrialised world in order to mitigate the causes of climate change. • Assistance to the countries across the Global South that are most affected by climate change to mitigate the effects, not least in changes in agricultural practice. • Assistance to the same countries to develop low-carbon economies such that they may further develop and industrialise without amplifying climate change. • Investment in water storage and carbon-neutral desalination technologies to mitigate the impact of fresh water shortages, especially in the Global South. Probably the greatest current challenges are to recognise much more fully that migration and climate change are now inextricably related and that that this is an issue for the “now”, not the future. Maya regularly visits Afghanistan, and will give an overview of this forgotten war. Following the decades of civil war, leading to NATO armed intervention and the continuing threat from the Taliban and ISIS, grassroots peace activists are now bringing real change and hope to Afghans suffering fron crushing poverty and government inertia. The outcome of the General Election has brought anti-war politics nearer to victory. Theresa May’s overall parliamentary majority has been wiped out by a surge of support for Jeremy Corbyn’s Labour Party. Her government now depends on the far right Democratic Unionist party, and may be fatally wounded. The election result shows that there is huge opposition to the British establishment’s warmongering and to its other skewed priorities. As a result of this state of affairs, any potential push for more military interventions, which is now more difficult, will be easier to challenge. A further indication that the forces of peace and progress are in the ascendancy is that Donald Trump has had to call off his planned visit in October for fear of mass demonstrations. This unprecedented blow against the special relationship and against Trump’s international reputation also proves that campaigning and protests work. However, Britain is still fighting 7 wars, and there are people right across the political spectrum who support them. Trump is even threatening further military interventions. We therefore need to strengthen the anti-war movement and increase our reach in order to solidify and extend the gains that have been made. Only a mass campaign for peace and social justice can overturn the establishment’s agenda of permanent war and the erosion of our security and our civil liberties. The Real Question for May: Is There Any War You Don’t Support? It’s a strange world when Corbyn’s courageous opposition to these string of disasters is portrayed by the media as vulnerability, says Chris Nineham. Which war is it that the media think Jeremy Corbyn should have supported since World War Two? Was it the Korean war, a US led intervention which led to the death of around two and half million people, the carve up of the country and eventually the frightening stand-off that threatens a new war today? 100,000 mainly conscripted British troops were sent to fight in this fiasco of whom over 1,000 died. It was so horrific that many historians regard it as being one of the key reasons for Labour losing the 1951 general election. Perhaps it was the Suez intervention in which Britain fought a colonial rearguard action against the Egyptian nationalist government of Abdel Nasser. Britain was humiliated and the Tory Prime Minister Antohny Eden had to resign after lying to parliament amongst other things. Or maybe it was the US’s war in Vietnam war in which they massacred up to two million people, bombed two countries to pieces and eventually had to withdraw in disarray. Vietnam was so unpopular in Britain – 71% of the British population opposed it – that even the Tory Party could only give verbal support to the American government. More likely it was the Falklands War in which even the Daily Mail called ’short sharp and very nasty’. 258 British Troops were killed, 775 wounded and hundreds of others psychologically damaged in a battle for a few square miles of barren land 8,000 miles from Britain, but still ‘ours’ apparently and well worth the toll in human life and happiness. Apart from the death and destruction – a total of the war achieved nothing but is widely believed to have played a role in Thatcher’s election victory in 1983. Perhaps it was Clinton and Blair’s bombing in Kosovo, which despite being painted as a humanitarian success, led to the deaths of hundreds of civilians, accelerated ethnic cleansing and the deepened divisions and dependency on the West that plague the Balkans to this day. Surely it can’t be any of the cycle of wars that we are involved in now? The centerpieces of the War on Terror, the attacks on Afghanistan, Iraq and Libya, are almost universally regarded as catastrophic, causing almost unimaginable carnage, failed states and deep bitterness against the West. Fierce fighting continues in all three countries, sixteen years later in the case of Afghanistan. Associated interventions in Syria, Yemen, Somalia and beyond have been equally disastrous. It is a strange world in which Jeremy Corbyn’s consistent and courageous opposition to these string of disasters is portrayed by the media as a point of vulnerability. Surely the real issue is that the party of government supported every one of these adventures and that the current Prime Minister has voted or argued for every one of them since she has been in parliament. And this is no academic question of record. Despite confusingly saying on her Trump love-in trip to Washington that “the days of Britain and America intervening in sovereign countries in an attempt to remake the world in our own image are over”, she applauded Trump’s missile attack on Assad in Syria, congratulated him on his MOAB bomb drop in Afghanistan and is keen to get British forces involved in an attack on Assad post election. Surely the question any half way thinking journalist should be asking is, are there any wars since World War Two that Theresa May would have opposed? Posted in General	| Comments Off on The Real Question for May: Is There Any War You Don’t Support? 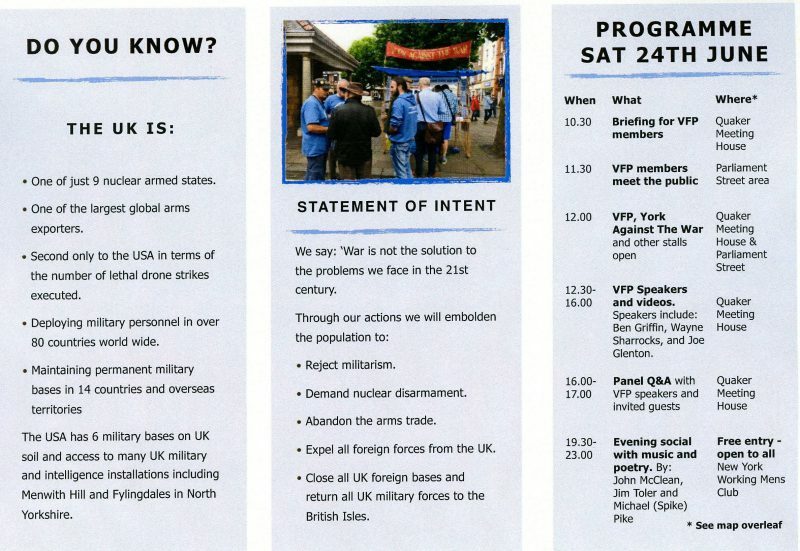 Veterans For Peace UK are holding a major rally in York for Armed Forces Day. Come and meet them throughout the day in Parliament Street and at the Quaker Meeting House in Friargate. There will be a variety of speakers, videos and stalls and an evening social which will include live music and poetry. 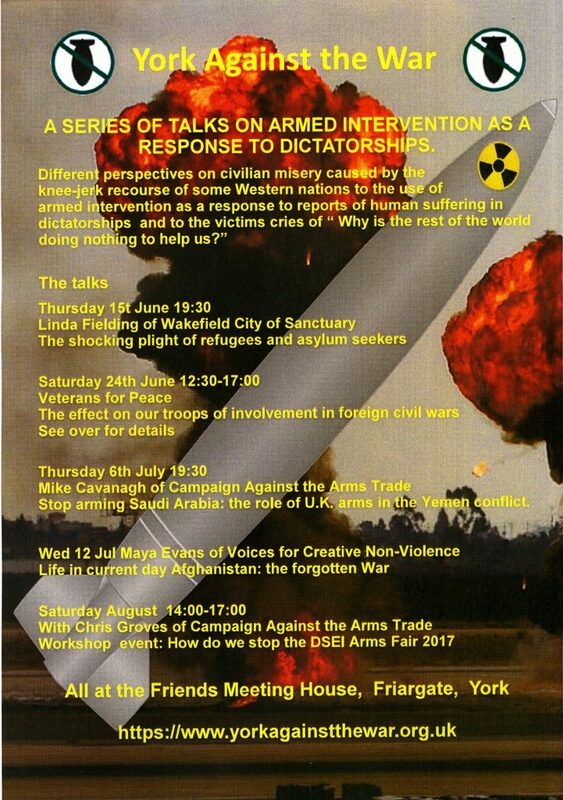 For further details see the VFP flyer or go to: <www.vfpuk.org>. The warmongering stance of the Tory government was further confirmed last week, when Foreign Secretary Boris Johnson stated that Britain would follow Trump in any new US attack in Syria. It is clear that the questions of foreign policy, war and peace will feature in this election and for once there are clear differences between the two parties. Labour’s leader, Jeremy Corbyn, is a former chair of Stop the War and a lifelong campaigner against war and for peace. This could not be in stronger contrast to the record of Theresa May, who refused on Sunday to say that the Iraq war was wrong, and whose closeness to Donald Trump makes her support for more wars almost certain. The war party refuses to draw any humane and rational conclusions from more than a decade and a half of ferocious military interventions, which have led to immense suffering, over a million deaths in Iraq alone, the torture of tens of thousands of people (including thousands of children), a mass refugee crisis, and the spread of terrorism across the Middle East, North Africa and beyond. The Tory establishment has also exhibited a callous disregard for international law and basic decency in its pronouncements in favour of nuclear weapons and, astonishingly, even of nuclear war itself. Defence Secretary Michael Fallon last week reiterated that Theresa May would have no hesitation to use thermonuclear weapons. He also added that the government would be prepared to fire these weapons of mass destruction pre-emptively, even if Britain was not under threat of nuclear attack. The Conservative government’s militarist and pro-war priorities are also obscene considering the mass misery and deprivation caused by the cuts in health care and welfare. The renewal and maintenance of Trident nuclear weapons alone will cost the taxpayer around £205 billion. This will have terrible consequences. Cuts to NHS and social care budgets have probably been the cause of 30,000 excess deaths in England and Wales in 2015 alone. We are urging all groups to hold local election hustings on these issues, involving candidates from parties opposing war and racism including Labour, the Greens, Plaid and SNP where appropriate, as well as to organise other public meetings and hold stalls against the continuation of Theresa May’s savage warmongering agenda. We are going through the fourth general election where Britain has been at war, and we need some honest accounting. Recent polls show some narrowing in the Tories’ lead. Grassroots anti-war campaigning can help change the outcome of this election. An anti-war questionnaire for parliamentary election candidates is available here. Despite considerable disarray continuing into its third month, the new US administration is showing more consistent, if not coherent, signs of how it will try to implement Donald Trump’s campaign proposals. In large part, these may be assessed as antithetical to a more sustainable security agenda, given that they promote military confrontation, undermine attempts to address climate change, and are, at best, incoherent in their response to economic inequality. Little of this translation to reality is likely to endear Trump to voters or his party. Greater policy turbulence, at home and abroad, should be expected ahead of mid-term elections next year. 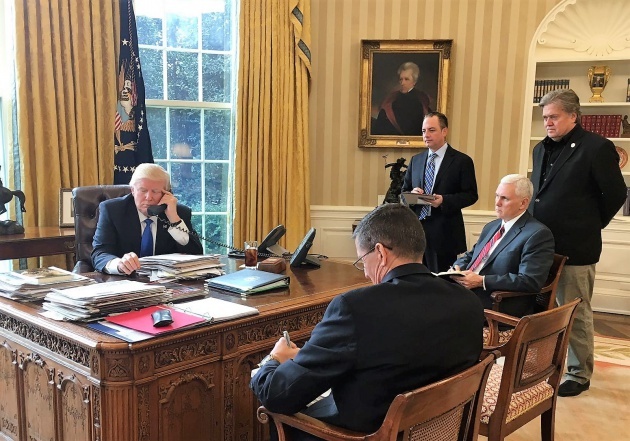 The Trump administration has been in power for 75 days; following the election campaign and the post-election transition it is now possible to get a reasonably clear picture of how its policies relating to security are taking shape. There has been much speculation that the United States will take a very different path to that of the Obama era, not least in relation to security and climate change, and since the United States is the world’s most powerful state it is appropriate to make an initial assessment of the changes as they may affect the sustainable security thinking with which ORG has been concerned for the last decade. Is the Trump era likely to make a major difference to the global security outlook or is it more likely that realities of international relations will limit the capacity for the change Trump seeks? Security challenges such as terrorism, crime and weapons proliferation cannot be successfully contained or controlled without understanding and addressing their root causes. ORG’s Sustainable Security concept takes a comprehensive, long-term approach that encompasses climate change, resource scarcity, militarisation, poverty, inequality and marginalisation. As the thinking has developed it has tended to group the challenges into three main areas, economic relations, climate change, and militarisation, and these are convenient headings with which to make an initial assessment of the Trump era. The issue of economic relations is seen as having as its greatest challenge the failure of the neoliberal approach to deliver economic justice, equity and emancipation, and the consequent growing divide between a relatively small minority of rather more than a billion people and the majority of the world’s population, with a clear rise in frustration and resentment among that majority at relative marginalisation and lack of life prospects. In the environmental context, while a number of resource limitations and regional environmental impacts are important, the emphasis in the ORG analysis has to be on the most significant trend – climate change and especially its impact on human well-being especially as a result of severe effects on food production. Finally, militarisation is seen partly in terms of a particularly entrenched and powerfully influential economic sector but most significantly as a culture in which the early use of military force is essential in maintaining the status quo, however unequal, unjust or unstable that order is. In all cases, the ORG view is that these approaches are thoroughly inappropriate if we wish to avoid an unstable and violent world, and much more emphasis must be placed on the underlying causes of the problems and how they may be addressed. The failure of the current 15-year war on terror is the most grievous example, having led to hundreds of thousands of deaths, millions of displaced people, at least three failed or failing states and a continuing perception of the threat of political violence in western countries. The question, simply, is how does the new Trump era affect the possibility of taking the wider view? The early indications are that the Trump administration is a potentially unstable mix of those best described as economic nationalists and others, especially in the wider Republican Party, who are convinced neoliberals. The latter may be dubious about any trend towards protectionism and believe that in a free market which already favours the wealthy such protectionism may turn out to be counter-productive. In this view, transnational corporate organisation is a fact of life and no country, not even the United States, can go its own way for long. The economic nationalists, who are dominant within Trump’s inner policy circle, are very strongly convinced that the United States has sufficient power to dominate the markets that matter most. Furthermore, the whole Trump election platform was predicated on strong opposition to the perceived elite, an establishment that “ran” Washington. His appeal to those left behind, especially in the post-industrial American Mid-West, was probably the most important element in his successful election and it is an approach that will not readily be abandoned. At the same time, he was committed to policies that would reduce taxes while scaling down the Obamacare reforms – initially both popular with his supporters. In the short-term Trump’s policies may be popular but it may be as little as a year before those left behind find that their predicament simply does not ease. Indeed, it is already becoming clear that health provision reforms will lead to many millions of Americans facing higher costs, including many of those who voted for Trump. More generally, economic nationalism may turn out to provide little gain for the country as the power of China and other major economies becomes more apparent. “America first” is simply not sustainable in a globalised world. Even so, what has to be faced is that the Trump era will not see any fundamental challenge to the neoliberal system, precisely in a period when that system is proving unfit for purpose. What may perhaps be more relevant is how long the Trump approach in its present form persists. The degree of disorganisation currently apparent in so many areas within the White House is hardly encouraging in terms of stability, and it may well be that as the 2018 mid-sessional elections to the House and Senate draw nearer, Trump’s singularly soft Republican majority support in both Houses of Congress will lead to sudden changes of policy. These may not directly address core issues of inequality but could take much of the remaining lustre off the Trump approach. This month has seen the very clear enactment of a number of policies that confirm that the Trump approach on climate change is one of denial coupled with the strong promotion of domestically-sourced fossil fuel resources. This is a highly negative approach for two reasons – there will be an increase in carbon emissions from the United States and a lack of leadership within the international community for addressing the considerable dangers stemming from climate change. This would seem disastrous for any hope of effectively preventing climate change but there are other very interesting factors at work. Firstly, the reality of the dangers of uncontrollable climate change is far more recognised across the world than a decade ago. Many more states are accelerating their moves towards renewable energy sources, with the biggest emitter, China, making remarkable strides. Indeed, China may well see its way to playing a global leadership role. Secondly, the rapid developments in renewable energy technologies are making renewable sources far more economic, with many further developments coming closer to fruition. The effect of this is that renewable energy utilisation is now competing much more closely with fossil carbon sources and, as a consequence, there is a rapid increase in investment in renewables. More than half of all investment in electricity generation is now in renewables and in the United States and elsewhere there is far greater potential for employment in renewables than in fossil carbon sources. Major problems remain including historic underinvestment in energy storage technologies and the need to cut carbon emissions by even more than most states currently accept, but the point here is that this is one area where there is every sign that Trump’s policies are obsolete and likely to ensure that the United States is left high and dry. Even in the face of that, though, the ideological certitude of the climate change deniers close to Trump means that the administration is unlikely to change. In short, the advent of the Trump era may limit the prospects for countering climate disruption but at least this will be another area where the Trump approach may be singularly counterproductive to any aim to make the United States the world leader. As with climate change, the first two-and-a-half months of the Trump administration have shown the translation of rhetoric into policy: control of migration, increased military spending and the more frequent use of force. Here, though, it is necessary to recall that the eight years of the Obama administration may have seen the withdrawal of US troops from substantial parts of the Middle East and Afghanistan but also saw the quiet transition to remote warfare with much greater use of air power, armed drones and Special Forces, not least in Libya and Iraq. The early signs are that Trump is expanding such operations rather than radically changing the posture and this includes even greater use of air power in the war against Islamic State (IS), as well as the deployment of even more Special Forces in Iraq, Syria and Yemen. These kinds of changes are being reflected in the manner in which the Pentagon is being given a much freer hand to conduct operations, but there are already consequences. A major raid in Yemen in late January failed to achieve its objective while also killing many civilians, and the much-expanded use of air strikes in Mosul in the past month has led to such an increase in civilian casualties that they are even being reported in the mainstream western media. Even so, such consequences are unlikely to carry any weight with Trump unless there are serious disasters involving US military personnel. The risk of this has been limited until now but one factor that has received little attention is that Trump’s Pentagon is advocating, and indeed already initiating, a substantial increase in the number of “boots on the ground”. In Iraq this is no longer just Special Forces but regular troop deployments which include, for example, units from the 82nd Airborne Division. Trump has also just agreed to give US forces in East Africa much more open powers to operate assaults on suspected al-Qaida-linked groups in southern Somalia, and there are also repeated calls for the Pentagon to expand its deployments in Afghanistan. As with economic issues, such actions may be popular with Trump supporters in the short term, examples of forceful action in the task of “Making America Great Again”, but based on the failures of the last fifteen years, the longer-term impact may be very different. What it does mean, though, is that as the United States seriously expands in overseas military operations then its close allies such as Britain will have to face up to whether they are willing to maintain their commitments. These are, indeed, different times and with all three aspects of the sustainable security challenge the election of Trump is likely to exacerbate ingrained problems. At the same time, his policies may become increasingly irrelevant concerning climate change and his economic popularity with his supporters may also erode quickly. This may well increase the temptation to use foreign military action to distract voters from domestic discontents. However, even in the military dimension there are unlikely to be any quick wins and Trump’s direction of travel means that his allies could quickly come under domestic political pressure if they were to stay closely aligned with the United States. In any case, the need to rethink our attitudes to security remains critical and it is best to see the advent of the Trump era as a period when even more opportunity for creative, critical and independent rethinking of security will be essential.